Today only, Amazon is offering up to 60% off Holiday Baking Essentials. There are a ton of natural and organic foods included like King Arthur, Arrowhead Mills, Wholesome, Simply Organic, Frontier and many more! Here are my favorite deals included in the sale. You can stack these savings with the 5-15% Subscribe and Save discount (optional), so I’ve included those prices below. Arrowhead Mills Organic Gluten-Free White Rice Flour, 24 oz. Bag (Pack of 6) as low as $11.82 after 15% S&S, so just $1.97 each! Wholesome Organic Cane Sugar 10 LB $15.65, so just $1.56 a pound! Arrowhead Mills Organic Buckwheat Pancake & Waffle Mix, 26 Ounce (Pack of 6) as low as $10.82 after 15% S&S, so just $1.80 each! Spectrum Organic Coconut Oil for Cooking, Virgin, Unrefined, 54 fl. oz. as low as $12.86 after 15% S&S! Arrowhead Mills Organic Rye Flour, 20 oz. Bag (Pack of 6) as low as $7.25 after 15% S&S, so just $1.21 each! 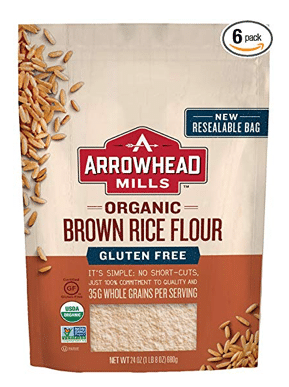 Arrowhead Mills Organic Gluten Free Brown Rice Flour, 24 oz. (Pack of 6) as low as $10.14 after 15% S&S, so just $1.69 each! Arrowhead Mills Organic Stone Ground Whole Wheat Flour, 22 oz. Bag (Pack of 6) as low as $7.21 after 15% S&S, so just $1.20 each! Frontier Co-op Ceylon Cinnamon, Organic Fair Trade Certified, Powdered, 1 Pound Bulk Bag (clip 10% off coupon under price) as low as $8.99 after 15% S&S and coupon! Arrowhead Mills Organic Oat Flour, 16 oz. Bag (Pack of 6) as low as $8.21 after 15% S&S, so just $1.37 each! There are a bunch more deals included in the sale, so be sure to check them out here as these are really great deals you won’t find in store!